KayKiSpeaks.com: Diddy Reunites Bad Boy for an Epic Performance at this years BET Awards!!! 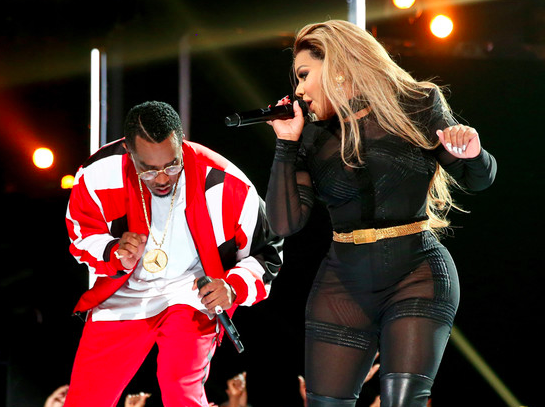 Diddy Reunites Bad Boy for an Epic Performance at this years BET Awards!!! Yes! This years BET Awards got off to a really good start. The hosts Anthony Anderson and Tracee Ellis Ross of the hit show Blackish were incredibly funny. The celebs were all having a good time, and the performances were pretty darn good. I think I speak for so many when I say most watching were waiting on two things to happen tonight- the Bad Boy reunion and Janet Jackson tribute. The latter came a little later in the show, but the Bad Boy tribute was one of the first performances we got to see. I sort of wished they would have left this one to the very end, because it honestly took the energy to a whole other level! Diddy brought out Ma$e, 112, Lil Kim, Lox, Faith Evans, and even his mini me lil Christian Combs. It was an AMAZING moment. The crowd got hype.. heck everybody got hype.. even at home Im sure!!! As the crew performed hit after hit, Diddy could be spotted doing his traditional Diddy Bop all over the stage. At one point he got way too exciited and took a tumble right in the middle of the stage. The Hip Hop mogul also forgot his part at one point during his set with Ma$e. The fall was hilarious, but Diddy popped back up like nothing happened and continued the bop! Lol The guy was rightfully excited about being on stage with one of the baddest groups the hip/hop r&b music scene has ever had. It was a 20 yr. reunion for them, and he started it all. He couldn't contain his happiness. They covered the hits, and even had a special moment of tribute to BIG! It got bigger and bigger as each artist came out to do their jam. As soon as the audience could see who was coming out the mirror tunnel for the next song they got more and more hype. It really was a dope moment. Salute to Bad Boy for that reign of classic records they had. I just got my life!!! I think most of us can agree that the moment that really stole the show was Kim popping up for her verse in All About the Benjamins!